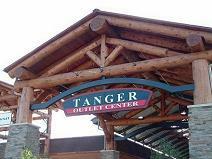 There is a brand new Tanger Outlet Mall Wisconsin Dells. They just happened to be hosting the grand opening the day we stopped by. We were quite amazed to see the huge parking lot and how full the lot was so early in the day. The entrances and the mall itself is in keeping with the rustic timber framed northwoods appearance that many of the businesses have adopted in the area. 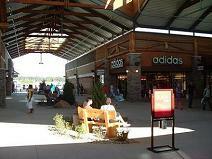 The mall is adjacent to the Great Wolf Lodge and very convenient to access from the interstate. Also, it is an open air mall, much like those found in Southern California. When all the stores are completed they will have over 60 stores (see listed below) at Tanger Outlet Mall Wisconsin Dells. We did some shopping at many of the stores. I pick up some shorts and shirts at a really great price. Beth needed to purchase some bridal shower gifts and found some great ideas at several stores. There are still several more stores to open in the mall, but this place already has everything you need to fit your style and taste. Speaking of tastes, we did stop at the Fudgery and sample fresh warm fudge to conclude our day. They have tasting demonstrations throughout the day, so be sure to check that out. The address of the Tanger Outlet Mall Wisconsin Dells is 210 Gasser Rd. From the Interstate, go North on Hwy 12 (Wisconsin Dells Parkway) at Exit #92. Travel .3 miles and go left at the first traffic light onto Gasser Rd. Tanger Outlet Mall Wisconsin Dells is located .3 miles on left. Phone 800-409-1603 or 608-253-5380. In addition to the new Tanger Outlet Mall Wisconsin Dells, the downtown Dells has some of the most unique shops and stores you’ll find anywhere. If you like candy and fudge, you’ve come to the right place. There seems to be a candy store at every corner as you walk down the strip known as Broadway. Also, just like many other tourist type areas, the Dells has it’s fair share of custom t-shirt shops. We always have a blast walking in these shops and reading the new shirts they have out. There are also many other locally owned shops and antique stores to check out. All the shopping can be found at this one location, right downtown on Broadway. Walking up and down the strip has become a tradition and is the perfect ending to a full and fun day in the Dells. You will be amazed at how many people are out walking the strip during the evening.